These Ball Quart Jars with Lids and Bands are made for fresh food preservation and more. Use these glass jars for crafting, canning, food storage and other household storage. 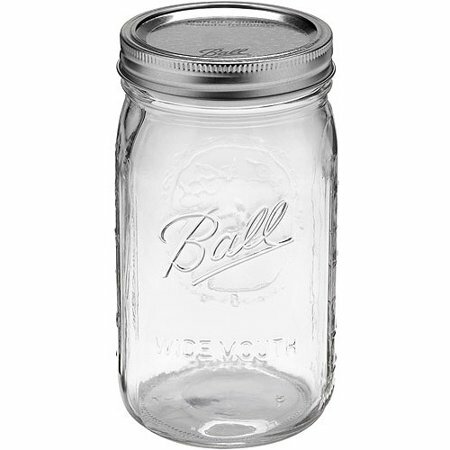 The Ball Jars, 12-count, come in a corrugated cardboard box for safe transport. Because of the generous mouth, the Ball Wide Mouth Jars are easy to fill. Wide mouth works best with whole fruits and vegetables or when you need a large mouth for filling. The glass is clear, so you can see what's stored inside. Bands can be reused. Jars are dishwashers and freezer safe. Note: When filling freezer safe jars, leave 1/2 inch headspace to allow for food expansion during freezing. Over 100 years of research, testing and advancing the art of fresh preservation go into every product we create. Great for cannisters or the freezer. I have removed all plasticware from my kitchen to get rid of BPA and BPS. I have purchased mason jars in several different sizes to store food in the pantry and freezer. I have a Reverse Osmosis water filter which I use to fill the jars instead of using plastic bottles. If the lids ever rust I know I can buy replacements just like I used to do when I did my yearly canning. Otherwise for storage, I can use a square of plastic wrap. The shipping charges were excellent compared to other online sites and they arrived in just a few days, even on Saturdays. They are very well padded so nothing was broken. I recommend these as a replacement to everything plastic that you are currently using. They have from 8 oz to one gallon sizes available. I picked up my online order at the store and on the way out I went by the aisle that had the jars. Lo and behold they had restocked them and the price was almost one half of what I just paid for my order. I went to customer service and they took back what I had just picked up and gave the ones from the floor for the lower price. I also bought something else and only paid a little moe than half for the entire order. Thanks Walart. I use 1 quart , wide mouth jars to make kefir. My only complaint is the Ball plastic lids you can purchase separately The lids do need t seal well & leak when turned upside down. The storage caps are not leak proof. The caps to not have a gasket which would prevent leaking. We recommend using the caps from dry storage, refrigerator use, or freezer use. excellent jars for canning, storage, beverages! I bought these jars as a secondary storage for my food saver (keeps things fresher for longer, and is more convenient for some things than using the bags). I also drink loads of water, so I bought myself an adult "sippy cup" cover that goes under the O-ring. These things are heavy duty. You can freeze in them and they will not crack. Also very durable. Jars came instantly, receiving day after I placed order. Instead of being packed in box bottom with cellophane top, packed in sturdy cardboard box with slots for each jar---great for storing jars in attic. Exactly what I wanted with price I wanted, arriving when I wanted. New Use for an old friend. I use these jars to make "Mason Jar Salads". I make my salads for the week on Sunday and they stay so much fresher than they do in plastic. I make steel cut oats for the week and do the same thing. My daughter does it now too. A new use for an old trusted friend. Perfect for "salad in a jar"
I ordered these to vacuum pack chopped salad and it works wonderfully. For anyone who wants to try this Pintrest craze, this is a great size for a side salad for 2 or a dinner salad meal for 1. The wide mouth makes it easy to fill and empty.